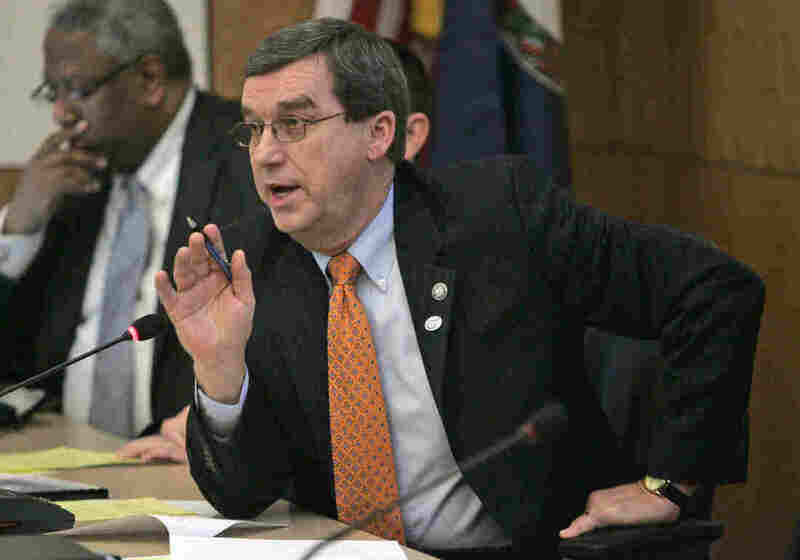 State Senator's Resignation Roils Virginia Politics : It's All Politics Gov. Terry McAuliffe's efforts to expand Medicaid under the Affordable Care Act have been thrown into further uncertainty by the actions of a single Democratic legislator. Virginia state Sen. Phillip P. Puckett, a Democrat, in February 2010. Puckett resigned his seat on Monday. A single legislator in Virginia's statehouse normally doesn't rate much attention beyond, say, his or her district or Richmond, the state capital. But then again, the resignation of a single Democratic state senator doesn't normally shift control of Virginia's Senate from Democrats to Republicans — a move that possibly stops dead in its tracks Democratic Gov. Terry McAuliffe's plans to expand Medicaid under the Affordable Care Act. There's more than a simple resignation at work in the case of state Sen. Phillip P. Puckett. By resigning Monday, Puckett placed himself in a position for an appointment to a paid post on a state tobacco commission — from the same Senate he just put into Republican hands. His resignation also opened the door for the same GOP-controlled Senate to appoint his daughter to a state judgeship with a six-year term. As a point of honor, Virginia legislators have refrained from appointing family members of sitting lawmakers to be judges. His resignation cleared the way for her. The resignation immediately raised suspicions of a quid pro quo. Journalists were unsuccessful in their efforts to reach Puckett; at least one top state Republican lawmaker told the Richmond Times Dispatch that he was unaware of any backroom deal. In any case, the ensuing controversy caught some of the involved officials by surprise. The Times Dispatch reported the cancellation of a hastily called tobacco commission meeting for Wednesday on which the hiring of Puckett by the agency was on the agenda. Meanwhile, by late Monday, Puckett let it be known that maybe he wasn't really all that interested in the tobacco commission post anymore. Puckett formerly served on the commission as its legislative member. "I am deeply disappointed by this news and the uncertainty it creates at a time when 400,000 Virginians are waiting for access to quality health care, especially those in Southwest Virginia. This situation is unacceptable, but the bipartisan majority in the Senate and I will continue to work hard to put Virginians first and find compromise on a budget that closes the coverage gap." McAuliffe may still have enough support in the Senate — where post-Puckett Republicans will have a 20-19 advantage — to get his Medicaid expansion through. Three Republicans have said they support the expansion. But passage isn't certain. And there's enough concern that lawmakers and the governor will fail to agree that there's talk that Virginia could have its first government shutdown. That a government shutdown didn't work out so well for the federal government hasn't stopped such talk.